Why are many of my friends leaving the faith? Mark Sayers offers some interesting facts how culture has influenced the church and has changed the way we worship and see God’s Word. 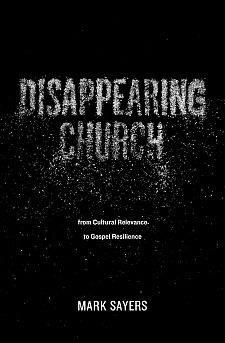 He has divided this book into two parts, (1) Understanding our craving for cultural relevance and (2) Learning Gospel resilience. He covers subjects of post-Christianity, the Gospel of self (Gnosticism), stop catering to public opinion, reject the implicit prosperity Gospel and others that will inform you at to the problem and why the church has changed. Hopefully this book will make a difference in how we see the Gospel and how we need to follow God's Word. I found the book very interesting and think that it is a subject that needs to be addressed in our churches. So many churches are struggling today and need to be offering the true of the Gospels. I would recommend using this book in discussion groups for an impact on making changes.